What is the most important information to know about Sunscreen Choices and making sure that there is excellent UVA and UVB coverage to protect against skin cancer risk? Our Lemongrass Spa Sports Stick sunscreen is a physical barrier (reflective) sunblock that blocks both UVA and UVB rays. We also do not use nano-particles. Nano-particles absorb as deeply as the bloodstream and should be avoided! 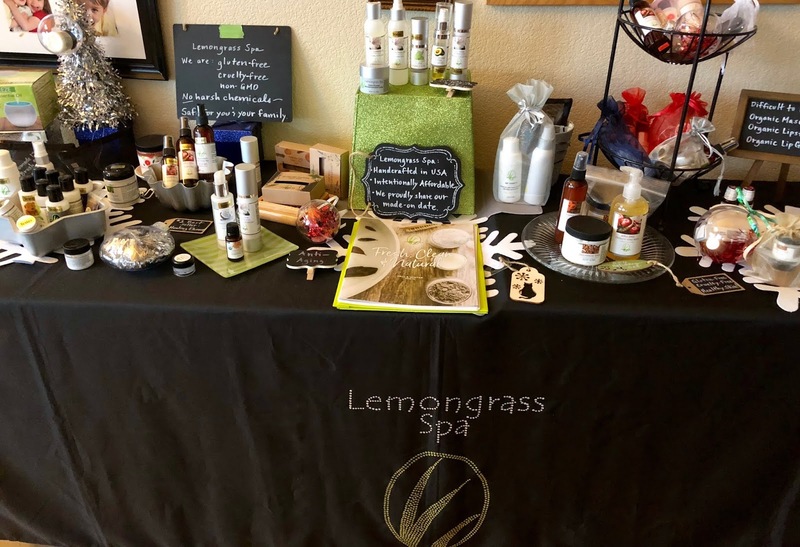 Lemongrass Spa Products never uses nano-particles in any of our products and our entire line is also gluten free and cruelty free. Your family won’t mind using our Sports Stick with 30 SPF because it does not feel sticky or clog your pores. My favorite way to use our Sunscreen Sports Stick is to apply "cheetah" dots and then rub those in. There are a few things that I adore about this when using on my own skin or on young children: you can literally 'see' what you have covered and what you have missed. I recommend the tinted Sunscreen Sports Stick, as this will warm up to your skin tone and not leave you with the white color from the version without the minerals. Note: know yourself! I have to re-apply sunscreen every two hours because I am very fair; waiting three to four hours to re-apply would be a disaster for me! Skin cancer is the most common cancer in the United States: An estimated 40 to 50 percent of Americans who live to age sixty-five will get it at least once. Look for full spectrum protection. The safest and most effective sunscreens protect against both UVA and UVB rays and form an actual barrier between your skin and sunlight. Ingredients to look for: zinc oxide and titanium dioxide. Go for a High SPF: The American Cancer Society recommends a sunscreen with an SPF of at least 15. Higher SPFS offer more protection, but above SPF 30, there’s not much difference. If you use moisturizers and serums, when should you apply sunscreen? “Which product should I put on my face first? Moisturizer? Sunscreen? Serum? Copyright 2019: all rights reserved. If you copy and share this post, you must include all information posted here through the full disclaimer (below). Disclaimer: this blog post is not to be interpreted or used as medical advice or expertise. I am not a medical expert and I am highlighting or sharing my personal experience in this blog so please know that individual results may vary or differ. If you have a medical condition, please talk to your doctor. One of the things I share in my talk or presentation for women about making ONE healthy change at a time, is how crucial it is to switch to Organic Cotton pads and tampons immediately. I highly recommend that you throw out the conventional ones today. It truly is not worth using the conventional products (full of pesticides and other chemicals) for one more day. Cotton is the #1 most sprayed crop and we use more pesticides on cotton than any other crop so we don't want to use cotton that is full of pesticides with our feminine products. I cannot even count how many women have reached out to me after my presentation at their networking group or Mom's group to share that they are no longer experiencing intense cramping, a feeling of nausea or even migraines during their cycle. The change they made was to ditch the chemically-laden feminine products and switch to organic cotton. Now...for some individuals...these symptoms subside as opposed to going completely away, but isn't that worth it as well? * Online stores, especially those that are health-minded and offer products that are organic. The brand that I personally use is NatraCare, but there are other wonderful companies as well. I would appreciate hearing your comments about whether this information made a difference for you. At a recent pampering evening for women, I was deeply reminded about why I started my Lemongrass Spa journey almost fifteen years ago. The evening was so wonderful, and gave women the opportunity to enjoy a massage, a therapeutic foot soak, an experience to make herbal tea, get a spine assessment and enjoy a hand spa treatment with me. There were also many other opportunities for women to choose from and even though it was a cold and snowy evening, the warmth in the room was palpable. At the end of the evening, there was one more give-away and Dr. Patti was gathering any ticket stubs from the front area when a mom sat down near me. I asked her if she wanted to enjoy a hand spa treatment and with a contented look on her face, she shared, "Thank you, but I'm really good." I asked her what she had enjoyed that evening and she had taken in the evening fully, experiencing a massage, a foot soak and much more. She shared that this evening was her first evening out since having a newborn and I was absolutely thrilled for her. Moms with small babies find it difficult to step away and take time for themselves, especially if they are on a breastfeeding schedule with their baby. The look of bliss on this mom's face was so wonderful and made me feel so happy for her. 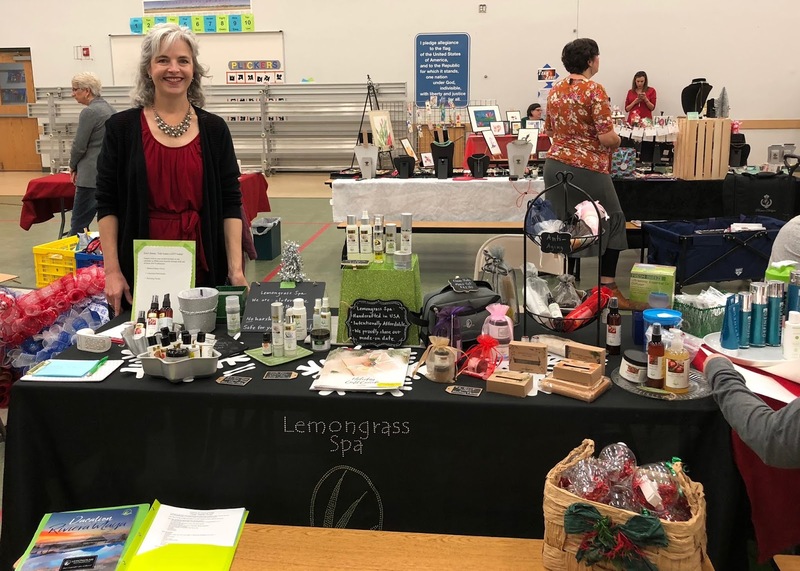 This moment with this mom took me back to my first spa evening in my neighbor's home, where I was the guest and we started the evening with a thirty minute massage, then enjoyed a hand spa and finished with a relaxing foot soak. I was in love with the experience and the idea that, as a busy mom, I could do something like this for myself in my home. It was the start of something much larger for me and in that moment, as I was being poured in to, I realized it had been a very long time since I had truly done anything for myself. Something consistent I have noticed over the past couple of years is that women want me to explain more and more how to explore a simple self-care ritual in their daily lives. Incorporating self-care in the midst of such a busy world is crucial and I think the simpler the self-care ritual is, the better. Some examples include: a one-minute body polish treatment on our hands, a walk around the block, rubbing peppermint balm on our pressure points, taking a bath, sitting quietly in a cozy chair without any technology interruptions, enjoying a cup of tea or whatever is relaxing and calming for you. What is your favorite simple self-care ritual? Do you find ways to incorporate it into your week? If not, imagine yourself putting that self-care time in to your schedule. How would that change your outlook for the day or the week for you? * Gather your balance and breathe in before lifting the sail. Lesson: make a plan before trying something new and breathe deeply to center yourself. * Always have the wind at your back. Lesson: you will build up momentum, so be strategic about having the momentum push you in a positive and helpful direction. Lesson: be flexible and be ready to move with the inevitable waves instead of letting them knock you off course. * Keep your back straight. Lesson: be sure of yourself and don't shrink down. Standing firmly keeps you steady. * Have your feet in a strong position. Lesson: be grounded and know where you are going. * Be aware of the wave 🌊 cycle because when you know they're coming, you can bend into them. Lesson: some challenges will be unexpected, but leaning into them helps you stay steady. Stiffening and resisting the waves is a sure bet that you will lose your balance. Note: I learned this the hard way when I jumped back up on the board immediately after a wave knocked me off and I didn't time my re-boarding with the wave pattern....lesson learned! * You can expect to fall in the ocean when windsurfing hasn't been experienced for thirty years. Lesson: small failures are part of the process so don't stress too much about them. Instead, brush them off and get back on. * When it is time to turn around, slowly pivot your sail, allow the front of your board to turn towards the shore and slowly walk around the board. Begin sailing again with the wind at your back. Lesson: a 180 degree turn takes care and decisive movement. * Don't be afraid to retry something you haven't done in a long time. 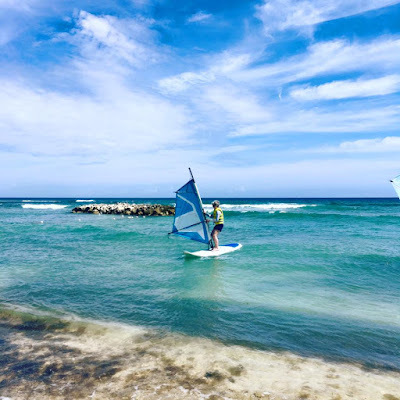 I had not windsurfed for thirty years and it was so exhilirating to try this again. Lesson: challenges keep us young and it is helpful to trust that you will remember what is important. Breathe in and take on the challenge and be willing to learn the inevitable lessons. Celebrate your willingness to grow and learn. Copyright 2017: all rights reserved. If you copy and share this post, you must include all information posted here through the full disclaimer (below). Disclaimer: this blog post is not to be interpreted or used as medical advice or expertise. I am highlighting or sharing my personal experience in this blog so please know that individual results may vary or differ. 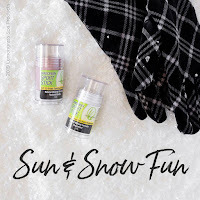 During the long winter months in Colorado, my skin does pretty well for awhile and then....as the dry, snowy and windy months drag on and on, it can be difficult to stay moisturized. I was a bit skeptical when I heard about a technique called Oil Cleansing, but as soon as I took the plunge, I realized this was exactly what my skin needed. 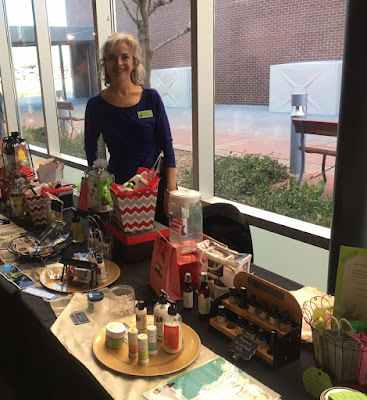 I had been using our Baby Massage Oil (with USDA Certified Organic Lavender and Vanilla essential oils) on my neck, arms and legs for years, but had not tried it on my face. However, with the rave reviews of a couple of my customers, I realized it would be silly not to try this technique. I was a bit nervous to put our massage oil all over my face, but it was exactly what my skin needed. 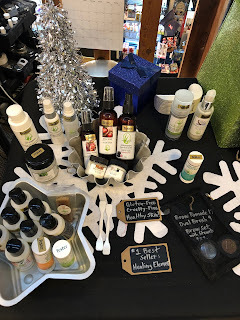 Several of my wonderful customers have asked where I will have a table set up so that they can come and try some of our delicious holiday scents in person. Snickerdoodle Body Polish, Candy Cane Bath Crystals, Frosted Cranberry hand-crafted soap or our top-selling Midnight Orchid luxurious lotion? All of these items may bring a thought or two to mind, but it is definitely powerful to try or smell all of these wonderful varieties in person. I am also happy to offer gift-giving ideas for any budget. If these dates don't work for you, let me know and we can talk on the phone or find an alternate time to meet. Our Black Friday exclusive bundle special will go live on Wednesday, November 23rd at 9:00 am. We do anticipate that these wonderful sets will sell out, so act quickly! I will have a Lemongrass Spa table at 5340 Coffee in Arvada with other local vendors. Shop from ten to fifteen local businesses and enjoy a new Golden brew-pub as well. Bonus: Bring a new toy for the toy drive and be entered to win gifts from the vendors! This is a wonderful event that you will want to attend. Please come by and see me and also meet other hard-working business owners who shine their brightest at these events. We would love to help you shop for the holidays and make the experience not only stress-free, but a lot of fun as well. If none of these dates works well with your schedule, then feel free to reach out to me and I will be happy to help you. I'm also available to help with personalized and complimentary shopping assistance.